Cooper Bussmann makes smart move with new combiner box. 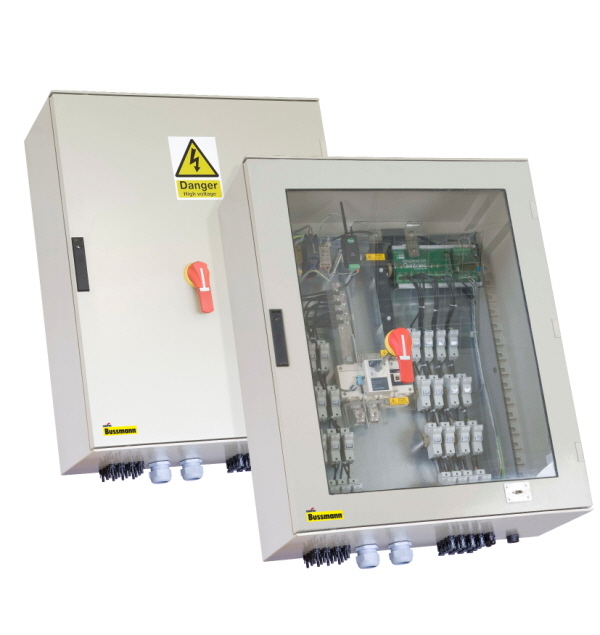 Fully customisable combiner box offers class leading PV system protection, switching and monitoring. Cooper Bussmann, the leader in critical circuit protection, power management and electrical safety, is launching a combiner box range that sets new standards in protection, switching and monitoring of PV systems. Designed for system voltages from 600V DC to 1,000V DC the new range combines the latest in overcurrent, overvoltage and monitoring technology in one robust, custom-built package. With a capacity of up to 24 input strings the combiner box can accommodate a wide range of input currents using 1-20A ratings in 10x38mm fuses and 25-32A ratings in 14x51mm fuses. Each fuse is housed in a gPV rated fuse holder with the 10x38mm modular fuse holders benefiting from additional fuse indication. Mindful of the high ambient temperatures experienced by PV installations the fuse holders are spaced to allow good airflow, a very important factor in dissipating excess heat. The type of PV installation design will influence the fuse protection configuration. Both positive and negative fusing for maximum system protection is recommended and the new range offers floating ground as standard. However, negative or positive only fusing can be accommodated if required. To combat overvoltages and surges from lightning strikes and static discharges there is the facility to fit either Class II PV surge protection device (SPD) of if necessary a Class I device. The Class II device includes patented, fast acting Short Circuit Interrupting (SCI) technology, which adds an additional level of protection in the event of a voltage surge. Where PV system monitoring is selected additional protection of the 240V AC mains supply and Modbus wired communication lines may be required to safeguard the monitoring electronics from voltage surges. Checking the status of the PV and 240V SPDs’ health is made simple with the inclusion of remote indication communication that integrates with the combiner box monitoring system. The replacement of activated surge devices is simplified thanks to the easyID visual indication and colour-coded plug and play modular design. Effective monitoring of the PV installation is a critical requirement in managing the system uptime, maximising productivity and efficiency. A number of options are available depending on the system requirements; either Hall Effect or Shunt- based monitoring units, and power supply options such as self-powered or externally powered. For fast deployment and ease of system inspection, the design includes an external Modbus RS485 service port, allowing service engineers to programme or interrogate each unit without the need to disconnect from the grid. Integration with the PV installation supervisory control and data acquisition (SCADA) system is made seamless with the use of industry standard Modbus communication protocols and the choice of standard 2-wire RS485 connection, wireless Zigbee or Cooper Bussmann’s industrial wireless system. For additional safety and security the range features true DC rated disconnect switches, rather than mcb-type switches which are not as reliable. The switch can be operated repeatedly without the risk of fire or injury. By locating the switch handle on the outside the combiner box can be safely disconnected from the downstream load before maintenance work is carried out. The lockout feature of the switch handle also ensures safe PV system isolation for maintenance of downstream components. In the event the combiner box is used in configurations with downstream disconnect, it can be supplied without a switch. Finally the enclosure plays a critical part in securely housing and protecting the internal components. All combiner boxes are rated to IP65 and include breather drains making them suitable for tropical and sub-tropical environments. Depending on the geographic location and application a choice of materials is available - UV stabilised Glass Reinforced Polyester (GRP) with or without transparent polycarbonate window, painted steel or stainless-steel enclosures.